Tired of "making do" with pants that are too short? Or not finding name brand pants in your size? Now you can find name brand extra long tall mens pants in 36 inch and 38 inch inseams that really fit. Haggar, Dockers, Callaway, Nautica, Polo, Bonobos -- they're all here. One of the largest online retailers has more than 150 pairs of tall mens pants in extra long 36 inch and 38 inch inseams from Dockers, Polo, Perry Ellis, Nautica, and more. 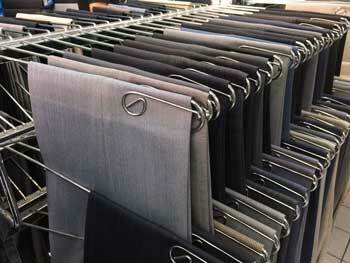 Extra long Bonobos, Cutter & Buck, J Crew, Peter Millar and more name brand tall mens pants in 36 inch inseams. Scroll down the size chart until you find Tall sizes. Macy's features extra long tall mens pants in 36 inch inseams and 38 inch inseams from Perry Ellis, Haggar, Dockers, Ralph Lauren, and more. Penney's has extra long tall mens pants in 36 inch and 38 inch inseams in casual and dress styles. Tall mens extra long pants from Bonobos in chinos, casual pants, and dress pants in 34" inseams and 36" inseams.